Christmas used to be magical! It meant Christmas cookies and Santa and flying reindeer and presents under the tree! A tree that somehow got covered with lights and the rest of the decorations magically appeared when you disappeared, so over the initial “decorating is fun!” thrill. It meant Christmas movie specials and holiday tunes on the radio for weeks! Cookies! Presents! Santa! Little toy drums! Rooty-toot-toots and rummy-tum-tums! 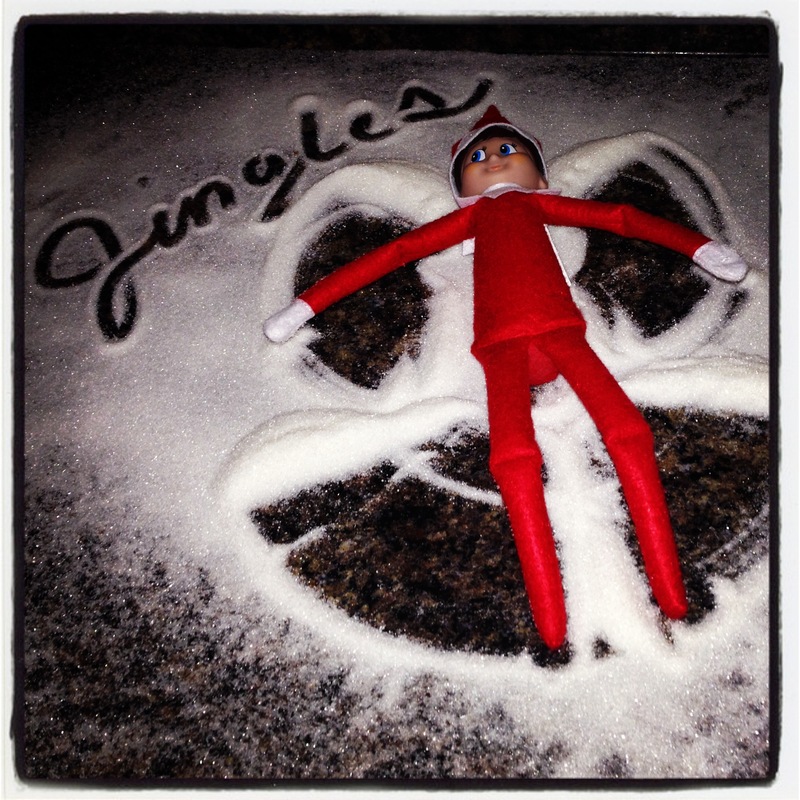 When you are little, holidays just kind of happen to you. As an adult, you are fully aware of the time, money and effort it takes to actually make them happen, or holidays risk becoming just another day on the calendar. I remember the first year my mom told Tessa and me (away at college) she wasn’t getting a tree, because it was too much work for just her to enjoy it. We were flabbergasted, unable to comprehend anyone going through Christmas without a tree. We felt bad for her, she felt bad we felt bad, and put up a tree all by herself for us to enjoy the few shorts days we were home. And for that, I am sorry, Mom. I get it now. 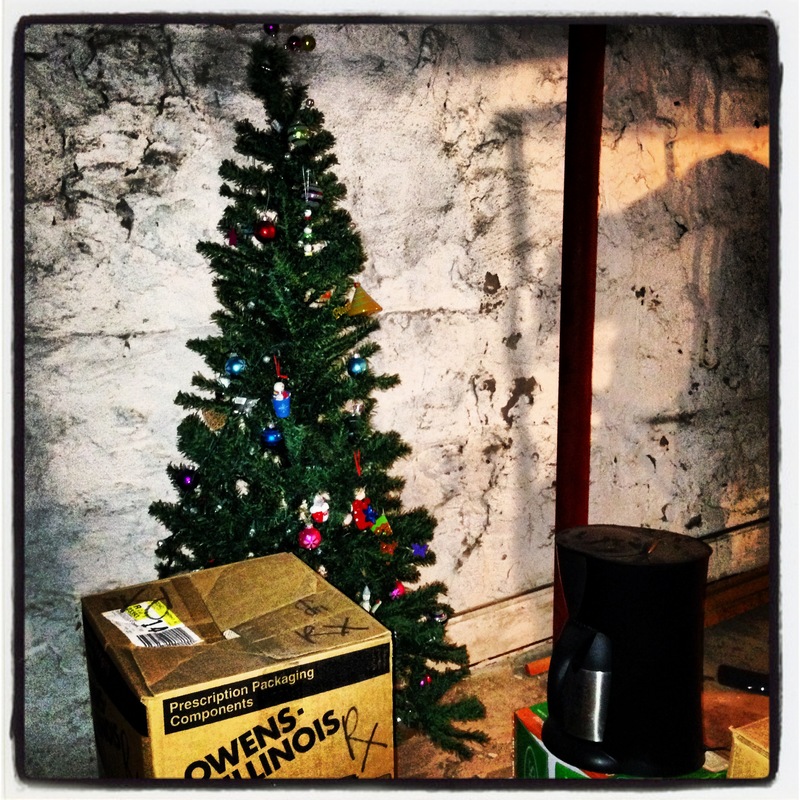 My basement tree. Maybe my holiday spirit is in that box. The first year I lived alone in my new house was the last I saw of my Christmas spirit. I bought a tiny fake tree, threw some ornaments and lights on it, and oohed and ahhed over it while my cat batted off all of the decorations. Then I left town every week in December for work. I enjoyed my tree for three whole uninterrupted days. All of a sudden it was January and it seemed like a lot of work to undecorate it, so I just carried it downstairs, all ready for next year. It never made it back up those stairs, and now I enjoy the magic of Christmas all year from the basement, every time I do laundry or scoop cat poo. Works for me. It’s not that I am a Scrooge. I actually love people who get all into the holidays. I think Elf on the Shelf is downright genius, Christmas cookies are delicious, upstairs trees are beautiful and I still love ABC Family’s Christmas special lineup (Holiday in Handcuffs anyone?). Love Actually is just as good as the first time I saw it and I listen to Christmas music voluntarily all year-long. It is not unusual to have a FaceTime session with my sister belting out Garth Brook’s version of “Go Tell it on the Mountain.” My apologies to her husband. But inevitably the magic melted and reality kicked in. It started to feel like more effort than it was worth. It meant decorating that tree by myself, a tree only I would enjoy, and if I got bored, I had a half decorated tree. It meant baking my own cookies (never gonna to happen) and driving three hours home in attempt to find that holiday magic I had lost. I didn’t find it there either. Christmas didn’t lose its magic because I was living alone. Through my newly acquired adult vision, I saw the dark side of this time of year: the nastiness, greediness, pointlessness, and a general over-doing-it-ness. I started to get why Dad wanted to abolish presents. Christmas started to mean wasting money on stupid crap nobody really needed. And traffic jams and crowds and people who care about nothing but finding everything on their list, plowing over anyone in their way. It started to mean little kids who already have a lot, getting more, and little kids who have little, getting nothing. There’s nothing magical about that. And I know that this isn’t even what Christmas is all about. But it kind of ruined it for me. Reality invaded my imagination, attacked the magic. I’m happy that I even experienced the magic at all. Some kids never get that opportunity. 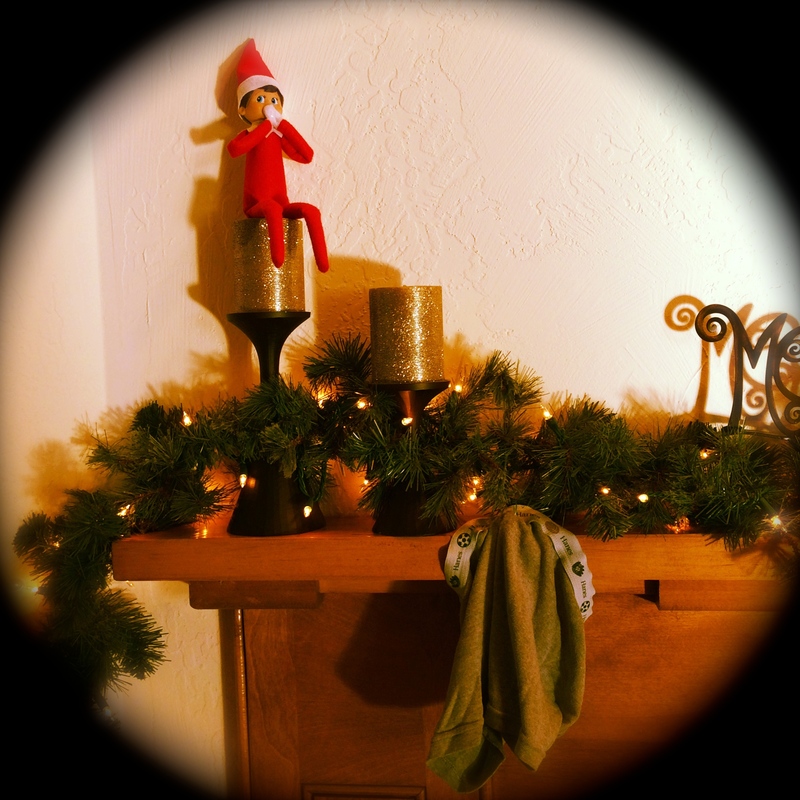 Jingle the Elf, swapping out the kids’ Christmas stockings for underwear. For the record, I believe The Children do have a special knack for bringing a little spark back to December. That’s one plus to having kids; they breathe the magic back into these deflated holidays. Perhaps I will eventually find some way to make Christmas meaningful again, one that doesn’t involve procreation, but until then, I am perfectly fine avoiding holiday cheer each year. The end of 2013 will take me to Patagonia where I will spend the holidays with a couple of gauchos and my friend Michelle. Oh, lest I forget, wish daughter #4 a Merry Christmas for me when you see her. Skip the gauchos and enjoy the sight & sounds of a Patagonia Christmas with your good friend & my adopted daughter.